Dwayne McCay (Ph.D., Auburn University) became Florida Institute of Technology President July 1, 2016. Previous service included Provost, Chief Academic Officer, Executive Vice President and Chief Operating Officer. He is also a Professor in Physics and Space Sciences and Mechanical and Aerospace Engineering. 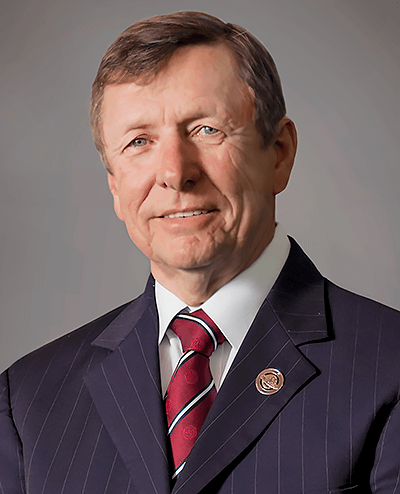 Before joining Florida Tech in 2003, McCay was Vice President for Research and Information Technology for The University of Tennessee System overseeing statewide research and information technology and the UT-Battelle management contract for the Oak Ridge National Laboratory. He also served The UT Space Institute as Alumni Distinguished Service Professor of Engineering Science, Program Chair of Engineering Science and Mechanics, and chief executive officer. His early career included: NASA Marshall Space Flight Center (senior engineer, branch chief, division chief); Air Force Rocket Propulsion Laboratory (senior research physical scientist) and ARO, Inc. (research engineer). McCay has authored over 100 technical publications including two books and holds 16 patents. He was inducted into the Florida Inventors Hall of Fame in 2017.